Through a grant from NATO, a team of Florida Polytechnic University student researchers has been utilizing a unique 3D printer to develop high-strength shells designed to increase the portability and efficiency of radiation detectors. Through a grant from NATO, a team of Florida Polytechnic University student researchers led by Robert Austin (left) has been working to increase the portability and efficiency of radiation detectors. We have student researchers working with a great deal of independence on a project that enhances the security of our country and other countries. A group of Florida Polytechnic University students and faculty are working on research funded by a North Atlantic Treaty Organization (NATO) grant aimed at streamlining the manufacturing and efficiency of handheld radiation detectors, which could be used at nuclear sites as well as for border patrol. “Radiation detection plays an invaluable role in confirming that nations around the world are complying with international nuclear agreements,” said Robert Austin, an instructor of physics at Florida Poly who was awarded the grant. Through the grant, funded by NATO Science for Peace and Security Programme, the team of researchers was able to purchase a special 3D printer that uniquely allows the printing of plastic reinforced with continuous carbon fiber. These carbon fiber shells will be used with other components of the detector being developed, under the same grant, at the Kharkov Institute of Physics and Technology in Ukraine. “The strength of carbon fiber and its transparency to high-energy electromagnetic radiation should allow us to make significant improvements in ionization detector efficiency and portability, which will improve international organizations' ability to regulate the development of nuclear power and weaponry,” said Austin, who is overseeing the first of two years of research associated with the project. Thomas Larson, who graduated from Florida Poly in the fall with a degree in in mechanical engineering, and Marshall Smith, a senior from Crestview, Florida, majoring in mechanical engineering, are collaborating with Austin to develop the thin shells which would be strong enough to withstand the high pressure of the radiation detectors. 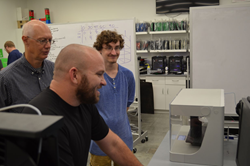 Larson said the specialized 3D printer is critical to the project. Austin, who has an extensive background in detector physics, said having the mechanical engineering students coming up with solutions has been very helpful. For the most recent university news, visit Florida Poly News. About Florida Polytechnic University: Florida Polytechnic University is an accredited member of the State University System of Florida, dedicated exclusively to STEM (Science, Technology, Engineering and Mathematics). The University is a powerful economic engine within the state of Florida, blending applied research with industry partnerships to give students an academically rigorous education with real-world relevance. The campus is located in Lakeland, Florida along the I-4 High Tech Corridor. Connect with Florida Poly.